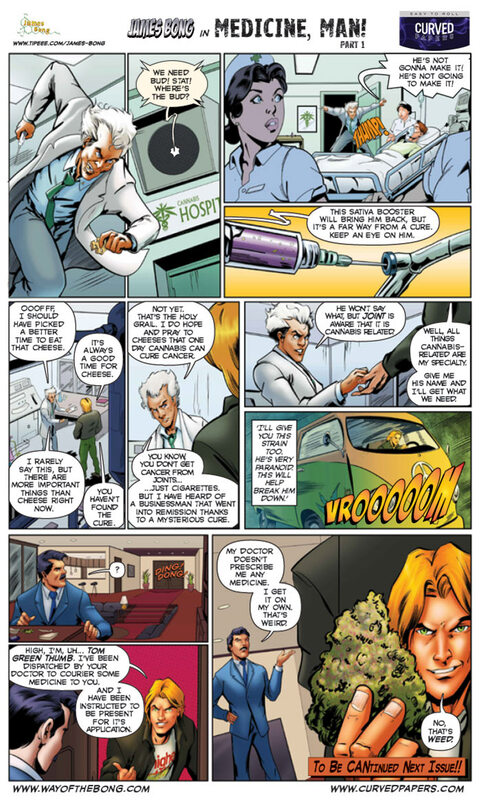 Cannabis Comics James Bong in Medicine Man! 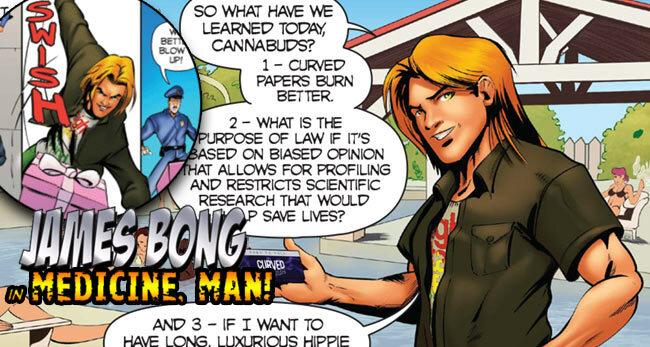 “Sure, you got cannabis comics and stoner comics, but this one is different: This is a cannabis comic, and James Bong is a hero for marijuana consumers everywhere! James Bong has been publishing internationally for 3 years and the creators are excited to include StonerDays weed clothing in their latest series. Mr. Bong’s adventures are inspired by real stories from the legalization movement, mixed with, of course, personal experience and all the ingredients of marijuana culture traditions. James mission is to protect stoners from harm and injustice, and change the perception of the plant and the community. He is the top shelf agent of J.O.I.N.T., a Justice Organization Involving Nugget Technology. 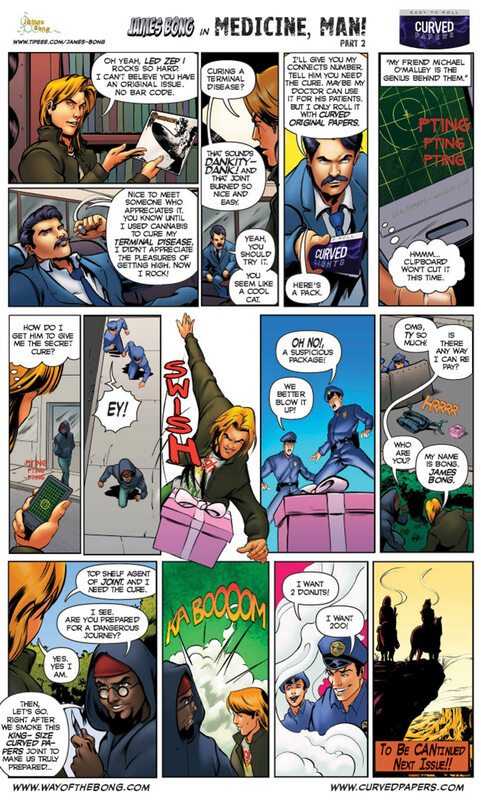 The story of the Cannabis Crusader began in the 2005 short film, “The Origin, or How I Learned To Stop Worrying and Love the JOINT”. 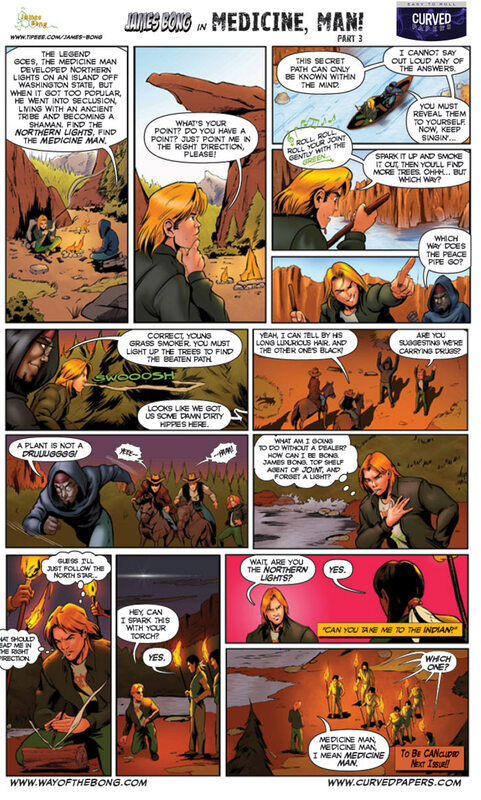 The comic is created and produced by Vigilante Entertainment and illustrated by an international team of artists. In “Medicine, Man!”, James is dispatched to retrieve a sacred strain rumoured to cure cancer from the hands of a mysterious shaman. Along his magical journey, with the help of a friendly neighborhood dealer, James must outsmart everyone from cops to cowboys as he travels from cities to the desert, determined to catch the buzz of the northern lights! 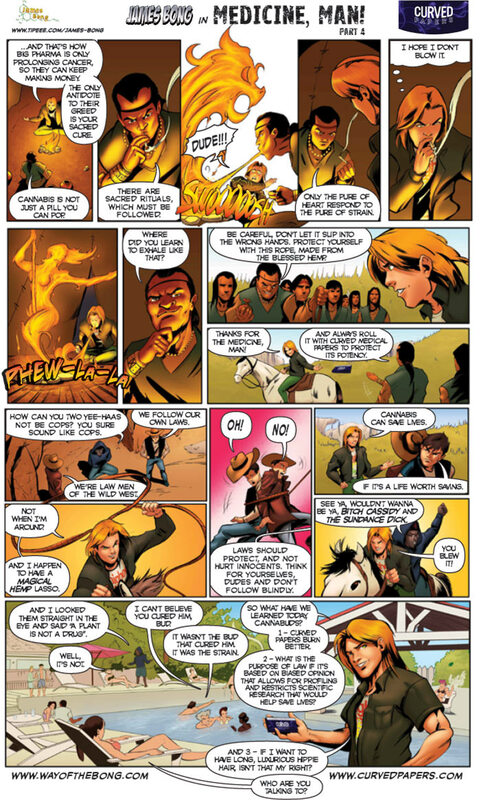 Whether you call it pot, herb, bud, chronic, or meds, prefer to smoke a pipe, vape, or roll it up, we’re sure you will enjoint the adventures of James Bong: Cannabis Crusader! Look out for the Stoner Days t-shirt James rocks on his travels! Want the shirt in this comic? Check out our Higher State of Mind Collection. This entry was posted in Featured, Marijuana Art, Stoner Blog and tagged cannabis comics. Medical Marijuana: Do you Qualify for a Legal Card?